The house provides 4 comfortable double bedrooms and a smaller single passthrough, 4 full bathrooms with shower, 3 living room with fireplace, and a large fully equipped kitchen with fireplace to cook. In all our years of travelling, Il Terazzo is the house that we liked most and we come back to almost every year. The well-equipped terrace, with te large sunscreen and the wonderfull view on the surrounding valley and hills, is the place where we spend most of our time, enjoying breakfast in the sun and dining outdoors untill late at night. It is the best equipped house we have ever encountered on our Italy holidays. We value good chairs and beds, but at most places especially the chairs and sofa's are hardly fit to sit on; not so for il Terazzo's, it has sofa's that are as good as we're used to at home. That's also true for the bathrooms (there are four of them!) and the kitchen. Unlike most kitchens we encountered, in this one it's really a pleasure to cook en try out Italian recipes. Like I said, we spend most of our time on the terrace but last year we had the chance to check out the sofa's because for the first time in all those years we stayed at Il terrazo, we had one day of rain and one day without sun; the rest of our two-week stay in June were as sunny and warm as we had become used to on our previous holidays at Il Terazzo. We thought the house was perfect already but they recently even added a charming patio with a swimmingpool, so now we can have breakfast at the poolside too! Il Terazzo is a very attractive medieval house Radicondoli in a charming medieval (very small) city where you live among the Italian citizens. Very much part of the charm is that you can hear the citizens chatting in the street when you open the windows of the two front bedrooms; they go out every night after dinner and stop to talk to each other, sometimes right in front of the house. You can go out and be part of it! In our experience they all go home before eleven pm and it's very quiet after that and in the other rooms and on the terrace we didn't hear them at all. 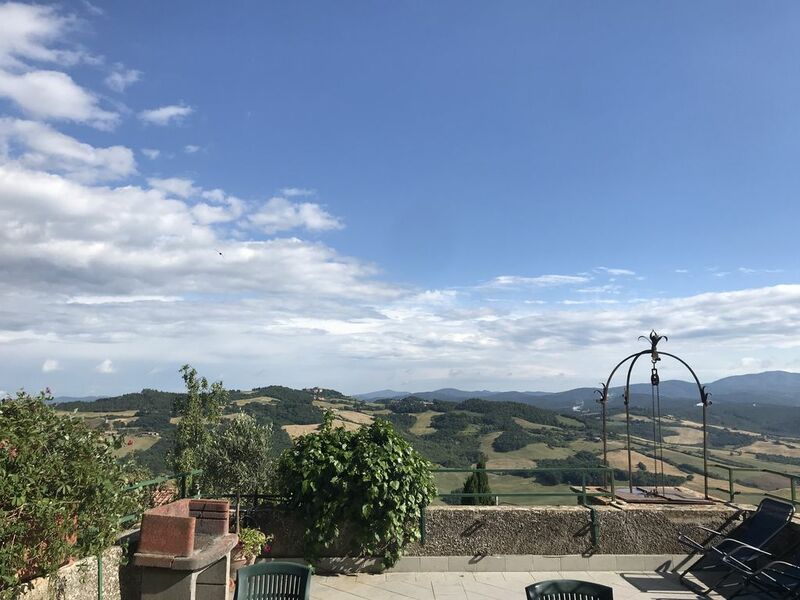 To experience such a house in such a scenic setting and close to Florence, Siena and San Gimignano too is something we hope to do again this year and for many years to come! "Il Terrazzo was just as advertised. A wonderful house in a wonderful town with wonderful people and a pleasant and gracious hostess. The people and the busnesses of Radacondoli were a joy to be with and to deal with. When I visit Tuscany again, this is where I will stay." places that we liked the best. In the course of a two week stay we had 10 visitors (not all at onetime). ALL raved about it. It is a well equipped large place. Having 3 bathrooms is a real plus & hard to find in other places. We ate out on the terrace several times. We were not quite prepared for the length of time (about 45 minutes) it takes to get to Siena, because we live out on the plains where 60 miles, means 60 minutes or less. But the winding roads were part of the charm of Italy. A wonderful house, not only very spacious and comfortable but also very special, historic and charming in a charming village and with a beautiful view on the landscape. Fully equiped kitchen and beautiful spacious terrace with all the amenities you need to have a wonderful time eating outside on the terrace while enjoying the view. Very friendly owner and gardians. Contacting the owner you will have all the informations that you need to reach Radicondoli and the house.